I Am INFI! An ode to Jerry, Garth and the entire crew!!! Discussion in 'Busse Combat Knives' started by DaZ403, Nov 30, 2015. OK. So In Canada we have a brewery that make a beer that is called Canadian. the advertising is simple but effective. They have been using the line 'I Am Canadian' So... I had to make a much stronger and relative statement!! The gauntlet has been thrown!! Share YOUR addiction!! Gotta wonder what the Busse Combat crew has for plates!! Very nice buddy! That being said, I think that down here in the good ol' USA my licence plate is ever so slightly better and with more INFI. Wouldn't really call Canadian beer... Awesome license plate tho! Yeah, near Columbia MD. You too? 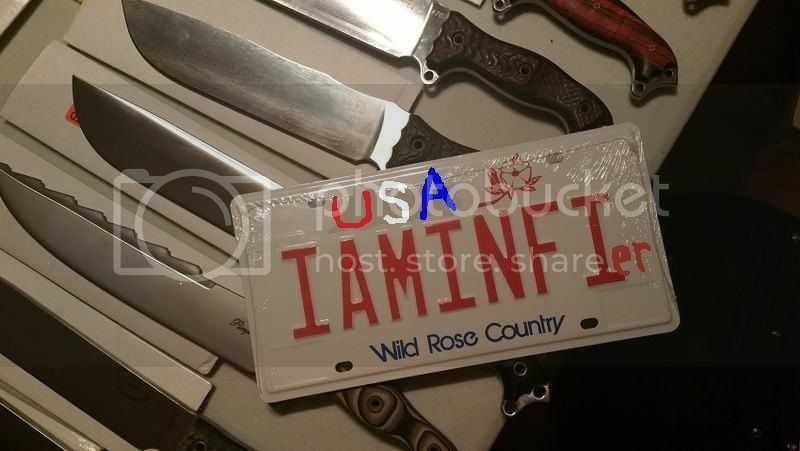 We'll have to start a program where we issue a $100.00 shop credit in exchange for sending us Busse inspired license plates. Do you make beer or kool-aid? The second is ON ITS WAY to Busse Headquarters!! The real question is... To sign it or not to sign it?? Whatcha all think? Sign it and send it back to you? Or let Bossman have it? I'd go with letting him have it. Maybe ask him to send you an autograph in exchange? I'll PM you the ship to address.